Sieve all purpose flour and corn flour together and keep it aside. Add eggs and sugar to a large beating bowl and beat till it becomes a thick paste. When the beater is lifted it should leave a trail for at least few seconds. Now beat in the flour mixture in two batches. Finally add the hot water and vanilla essence and beat for a min. Preheat oven to 390°F or 200°C. Line the baking pan (9" by 6") with grease proof paper and brush with some butter. Pour the batter upto 3/4th of the pan and bake it for 10-12 mins at 390°F or 200°C. Adjust the time according to your oven settings. Check if cooked by inserting a skewer in the center. Once done, allow it to cool on a wire rack for a while. Once cooled, sprinkle some caster sugar over it. Chop mango into fine bits. 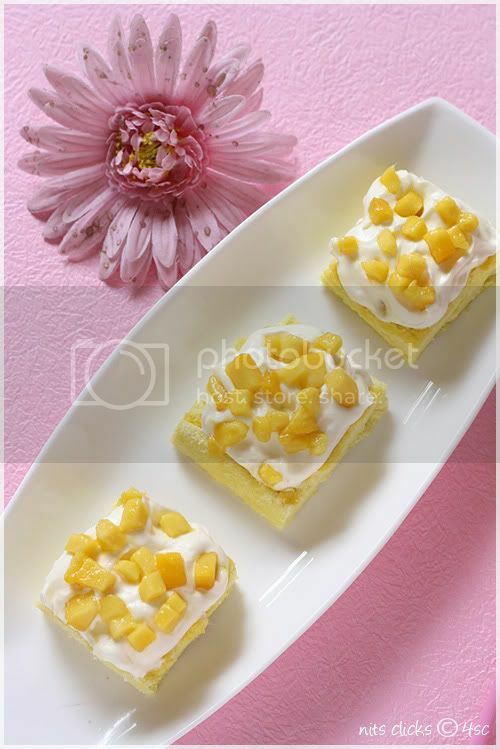 Slice the cake into squares and spread some whipped cream on top and decorate generously with chopped mango pieces. If you want to make Swiss roll cake pour a thin layer of batter in a larger pan (11 inches by 9 inches) and bake the cake. Spread a kitchen towel on the workspace and sprinkle some caster sugar over it. Turn over the cake on the towel and peal the grease proof sheet. Now carefully roll it along with the towel and allow it to cool. 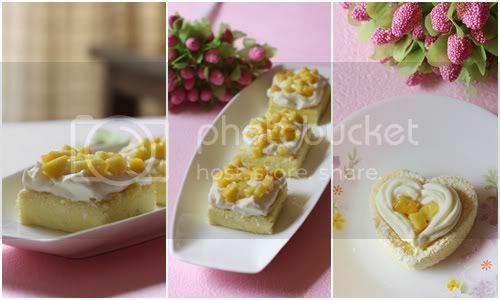 Since we have used fresh mangoes for the topping, its best to finish it up in a day or two max. Awesome swiss cake with awesome presentation and clicks!! 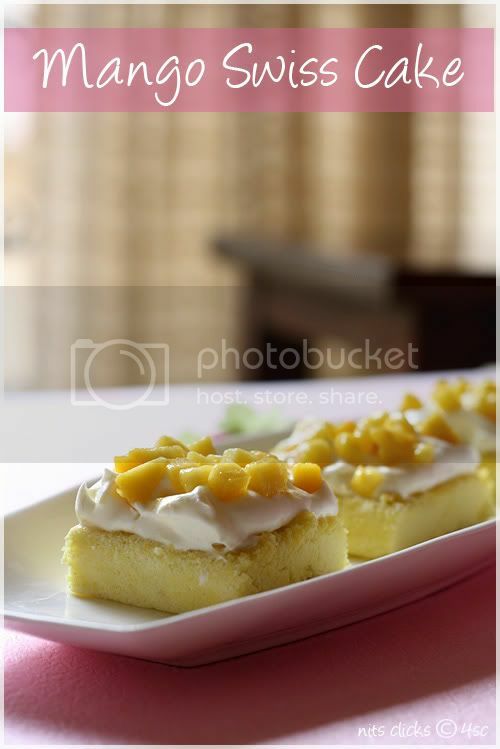 The cake looks so soft Nithya..loving your mango moods!! Amazing clicks and it looks easy also. Sure gonna try this out Nits. Loved this a lot. Wonderful........u have the most amazing recipes and breathtaking pics. 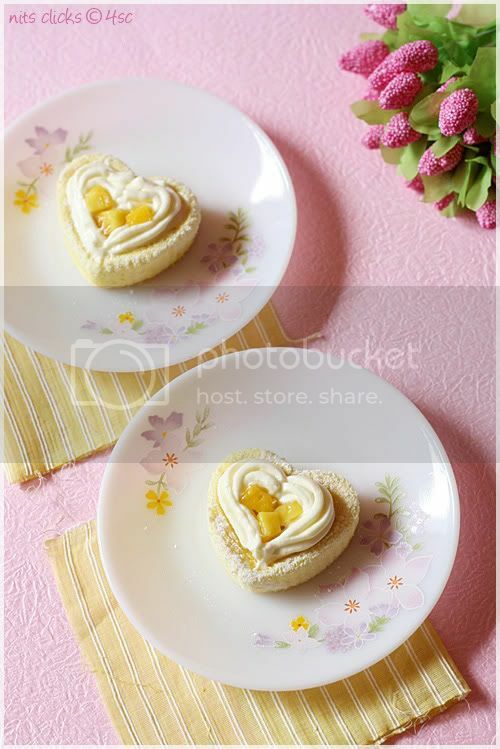 Love that heart shaped cake, looks superb and spongy..
that is one main reason why i don't want my hands on swiss rolls! ok i have idea if it doesn't turn up good...oh ya i adore when kids are in action the kitchen!! Simply Yummy Nithi... Appreciate your patience.. The texture of that cake looks superb. Just the thing for mango season. Awesome dear really love ur clicks.Some times i feel jealous dear i cant give like this clicks.Nice work dear. Great invention..very very tasty looking. Following you! Do visit my space too, whenever you get time. awesome presentation and super easy recipe ! OMG i loved the toppings lovlely looking cake..
shape does not matter as long as it tastes! !..u hv turned swiss roll into swiss cake,how cool is it!!! Bring out a soft pink cloud,I can float on one with one of your cakes in my mouth..! 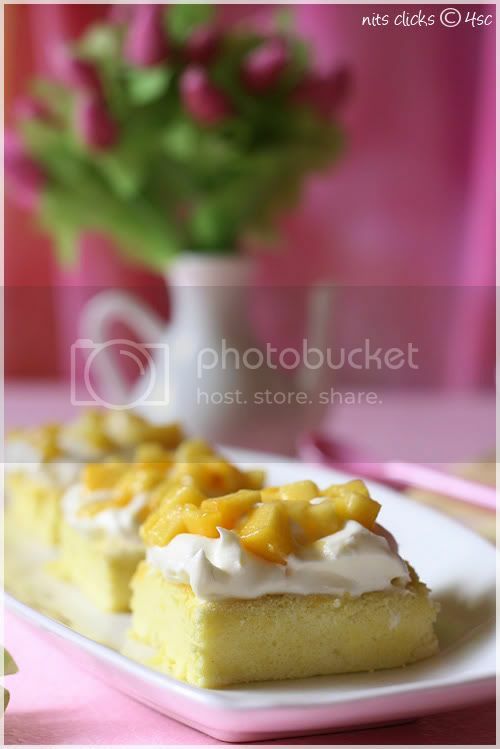 Mango swiss cake looks dleicious. Nice recipe. just awesome !!! cake looks lovely !!!!!!!!!!!!!!!!!!!!!!!!! 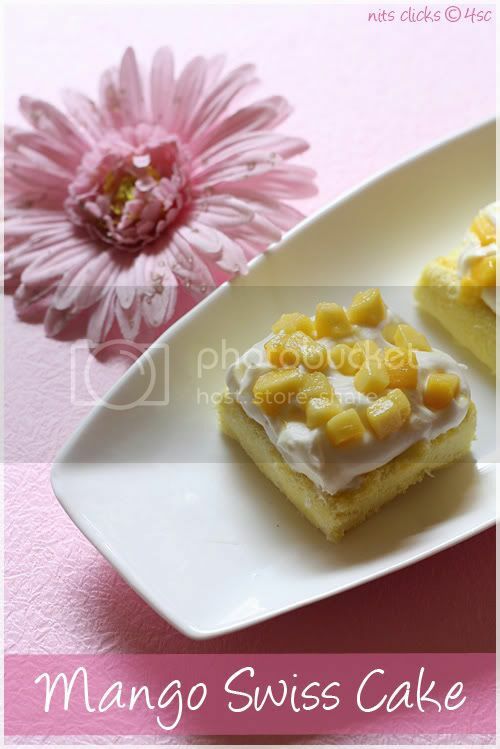 Delicious mango swiss cake,as always beautiful clicks. Delicious looking cakes! beautiful pics! 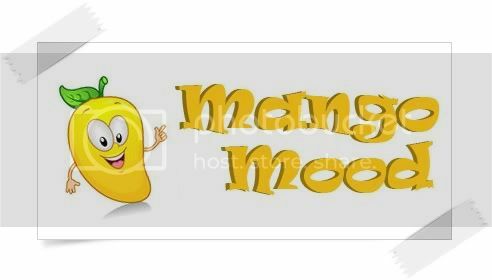 Someone's in a mango mood huh?! !And I'm totally loving it! 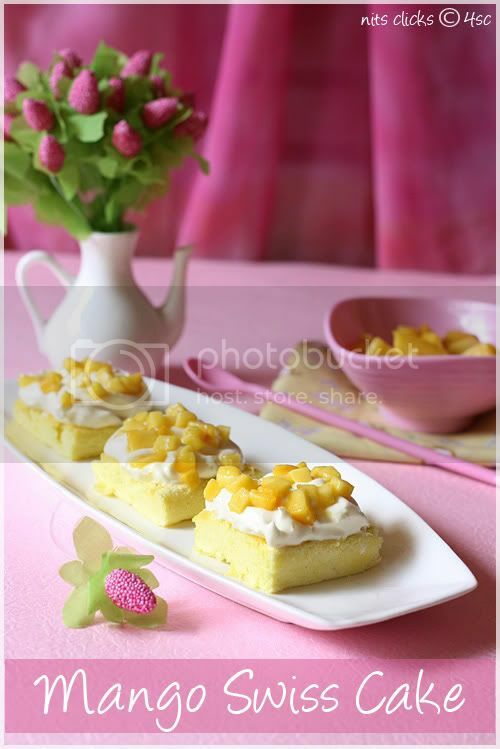 I'm lusting after those beautifully done swiss cake piece topped with fresh mango..! Pics are mind boggling too!! just go to Petitchef.com and click on "Add your site"
This cake looks just so amazing! Thank you for sharing the recipe!